starts my ST1300 instantly. Arrived next day too. Fast delivery and well packaged. Fantastic service with super fast delivery. Very competitive price for a good product. Fitted to a BMW 1200GS which needs a beefy battery to start being a big twin and so far it starts every time even when not used for a couple of weeks. Battery started bike first time even though I hadn't charged it and bike had been standing. Seems powerful. Too soon to say how long it lasts but so far seems excellent value. I needed a low budget replacement battery for my bike and this was the best I could find in a short search. The battery turned up as promised to my place of work on time I took it home and fitted it that evening and plugged it in to my trickle charger and the bike was good to go that weekend. This particular battery has a slightly higher ah rating than the original and was about £100.00 cheaper that was my main reason for purchasing it. I believe the battery I have replaced was the original, about 8 years old, so if this one lasts 4 years I'll be very happy and I will be sure to return to Tayna for the next one. Only fitted recently, so we'll have to see how the battery does as time goes by. So far though she starts up first time no trouble!!! 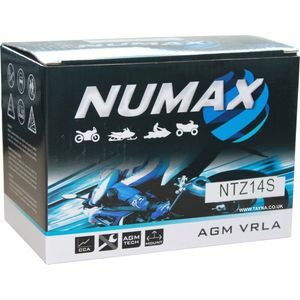 Never used Numax before, tend to use Yuasa. For a Honda st1300, great value, professional service, & fast delivery, I'm very pleased ! Easy to purchase great feedback from company with the added bonus of a super fast delivery service .. many thanks and highly recommended. Great replacement. Not let me down even after being stood for nearly 2 weeks. Perfect fit too. Not fitted new battery yet , but the service & help I've received has been first rate . I ordered what I thought was the correct battery but the check text I received prior to dispatch to correct my order was great , Saving time & money . Thank you John , a very satisfied customer . Great product and good price.The battery never arrived due to a poor courier service from.Yodel. As I was desperate for the battery I bought it from a local dealer and paid more. I found customer service from Tanya good and got a refund a week later. Good service,good product But let down by poor courier service who have an automated phone system and are uncontactable via phone or their Facebook page. charged it fitted it ,it worked I had forgotten how easy it could start.